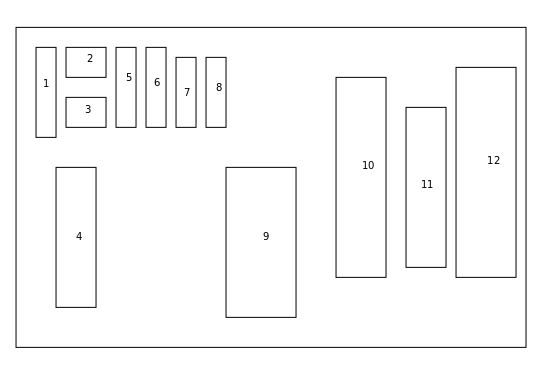 These are charts that I have done over some time. All are welcome to try them out, but please properly acknowledge! The are Egyptian from the 10th-16th centuries. 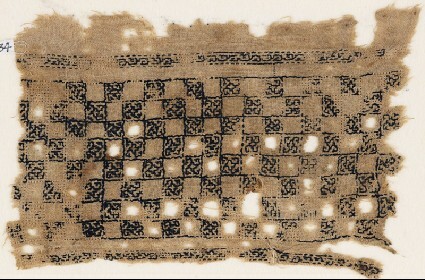 This sampler is in the Ashmolean Museum. 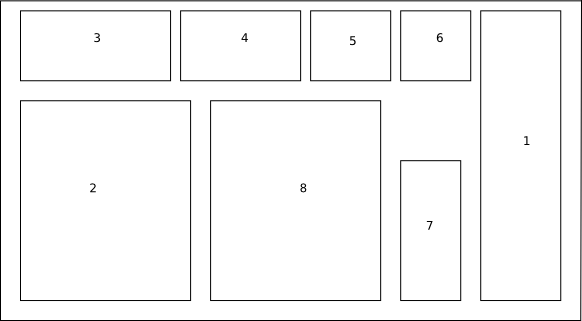 The whole design has been charted to a single page pdf document. Details of the item can be found in a post. This tiraz is in the Ashmolean Museum. Details on the item can be found in a post. This piece is in the Ashmolean Museum. Details of the item can be seen in a post. This item is in the Ashmolean Museum. More details on the embroidery are in a post. 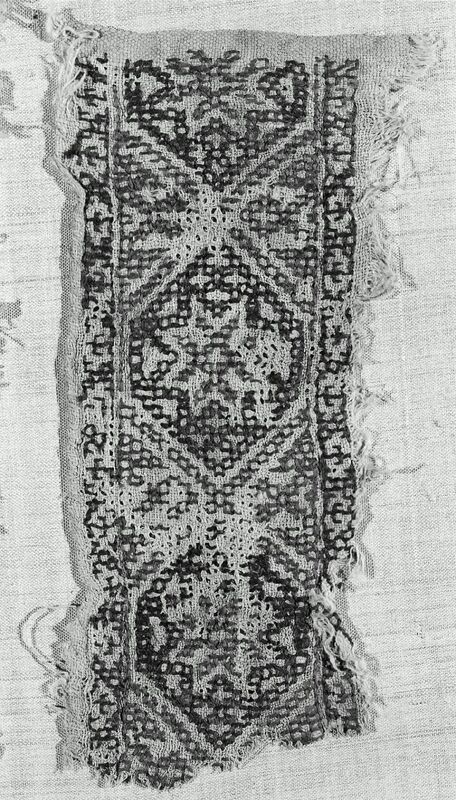 The pattern darning sampler is in the Ashmolean Museum. More details can be found in a post. There are many PDF single page documents to download. 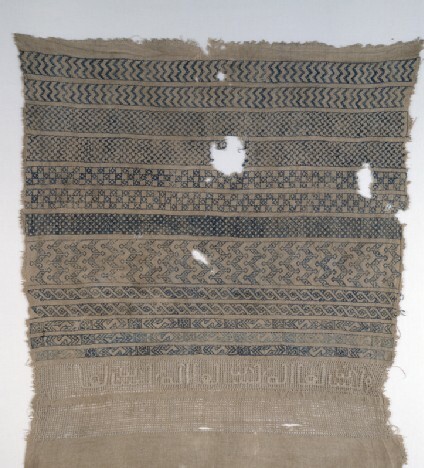 This sampler is in the Victoria and Albert Museum. There are more details on the sampler in a post. There are PDF documents to download. Some of the same patterns has also been interpreted by Mathilde Eschenbach. This textile is in the Ashmolean Museum. Details can be found in the post A Blackwork Challenge. 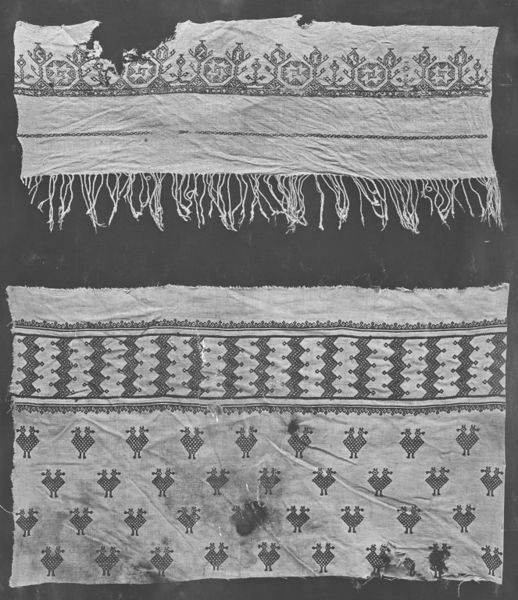 The textile is in the Metropolitan Museum of Art. Details can be found on the post A second towel embroidery challenge. This embroidery was found in the book “The Art of Embroidery” by Marie Schuette & Sigrid Muller-Christensen. 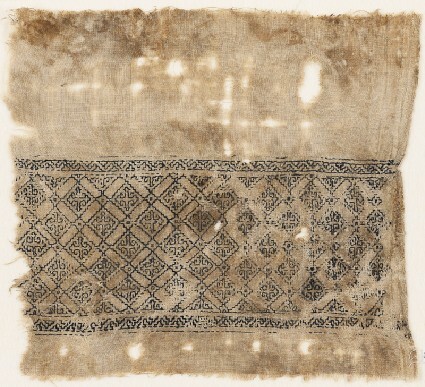 For more details on the item, please see the post “A complicated Mamluk Embroidery”. This textile is in the Ashmolean Museum. The details are in the post “A pattern darning chart”. The textile is in the Whitworth Art Gallery in the University of Manchester. 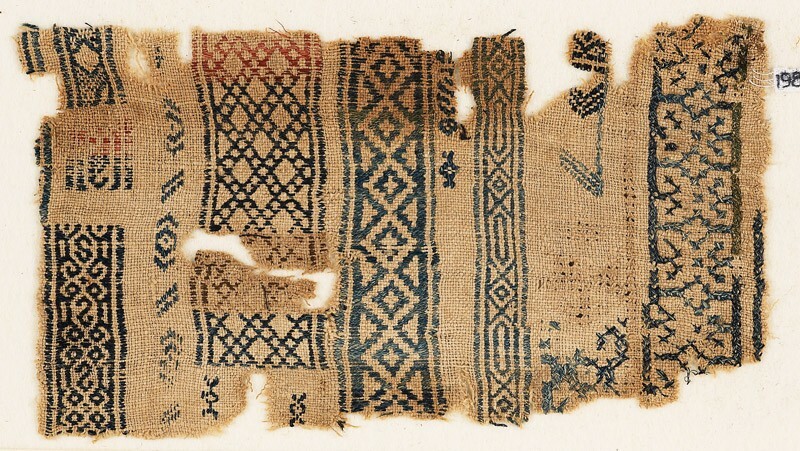 More information on this textile can be seen in the post “A new embroidery chart”. 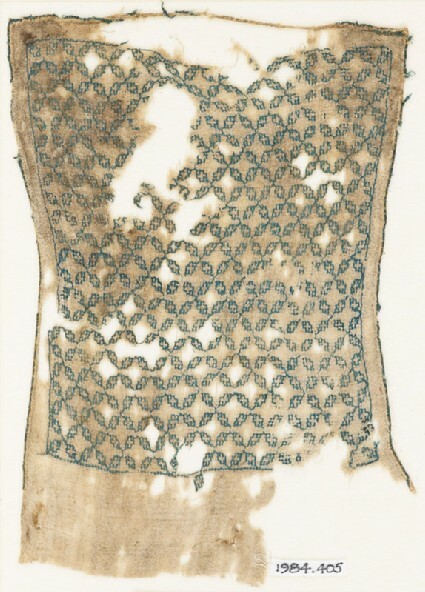 The full details on the textile can be seen in the post “Pattern Darning Chart”. The textile is in the Art Institute of Chicago. 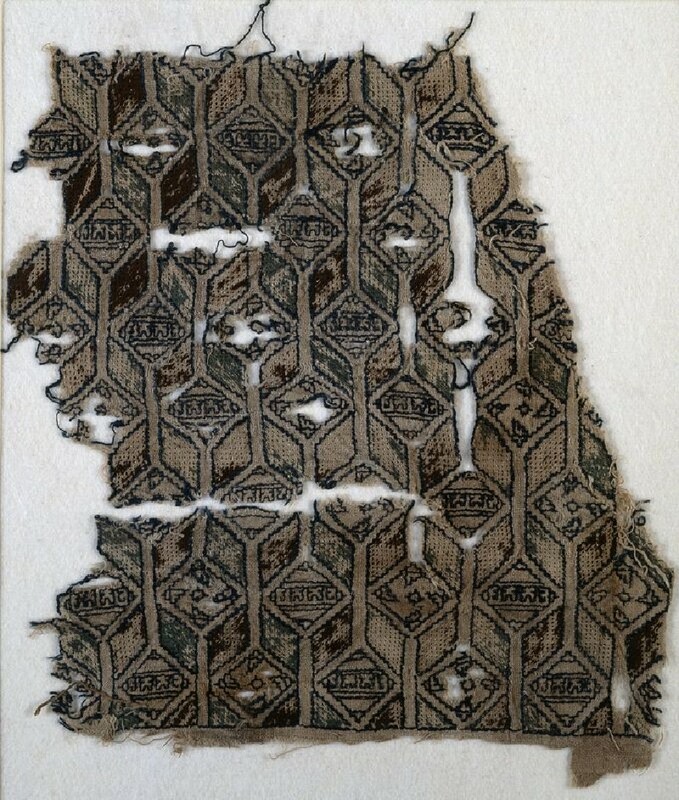 This textile is in the Museum of Fine Ats, Boston. The details on this can be seen in a post. This textile is in the Ashmolean Museum. 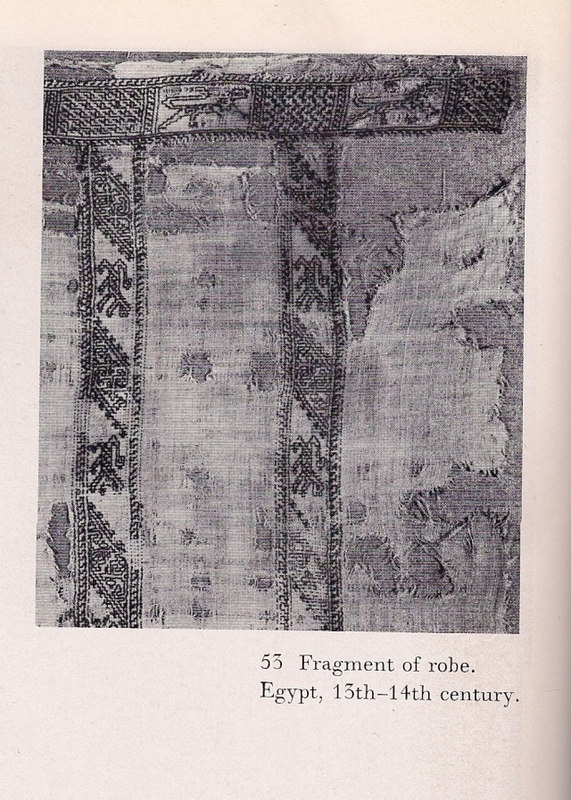 The details on the textile can be seen in a post. This textile is in the Ashmolean Museum. 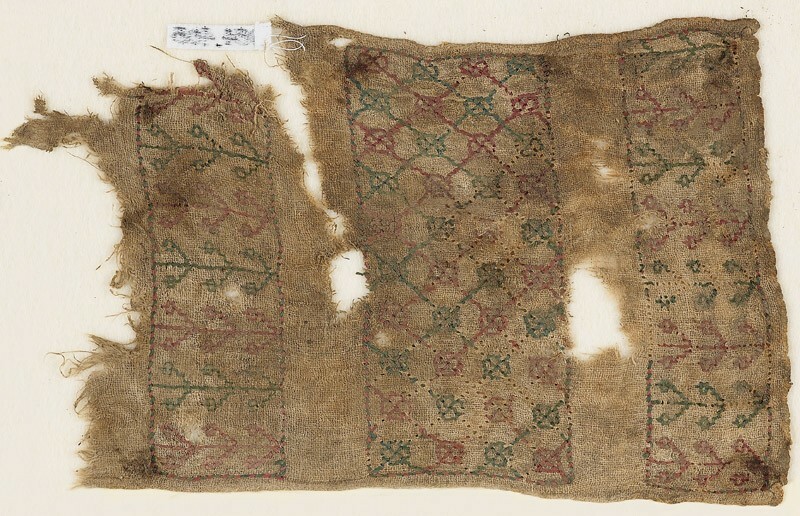 The details of the textile can be seen in the post “Interlocking fylfots chart”. 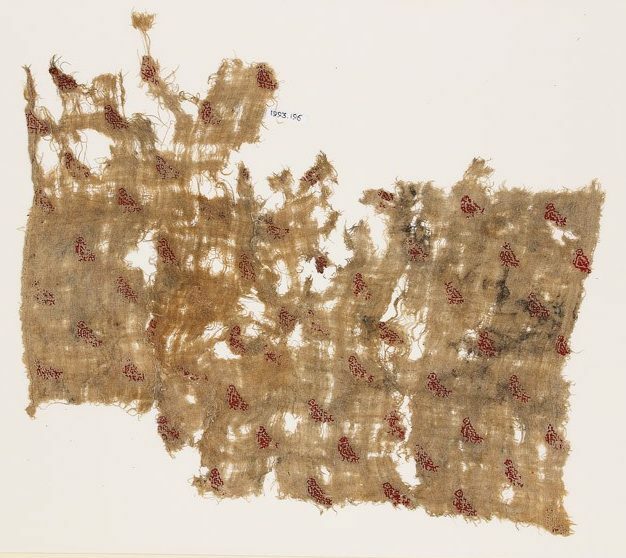 This textile is currently in the Ashmolean Museum. 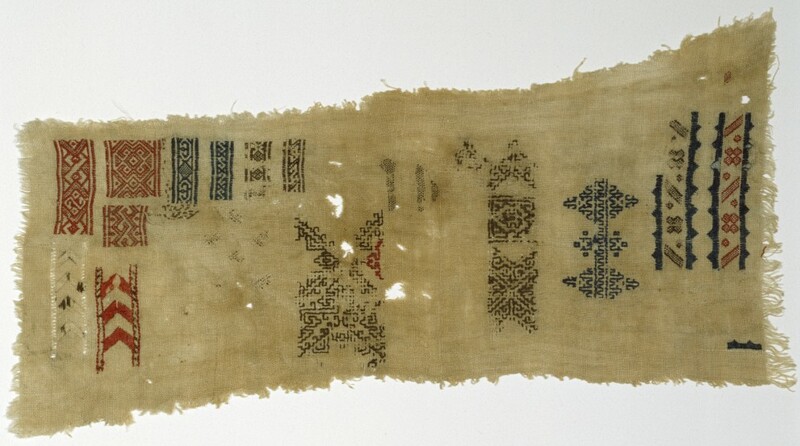 The post with information on the textile can be seen at “A chequered embroidery”. 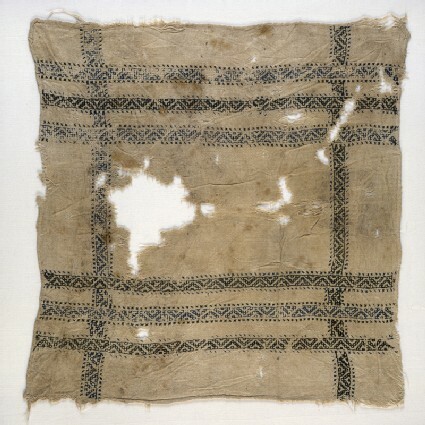 This textile is in the Ashmolean Museum. 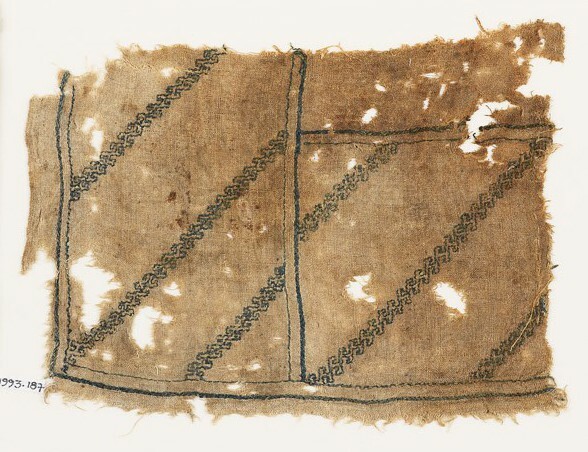 Information on the textile can be seen in the post “A diagonal embroidery with hooks”. 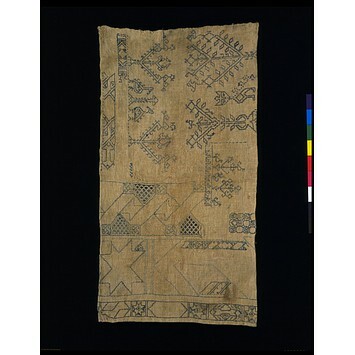 This textile is in the Walters Art Museum. Information on the textile can be seen in the post “A new mixed embroidery sampler”. 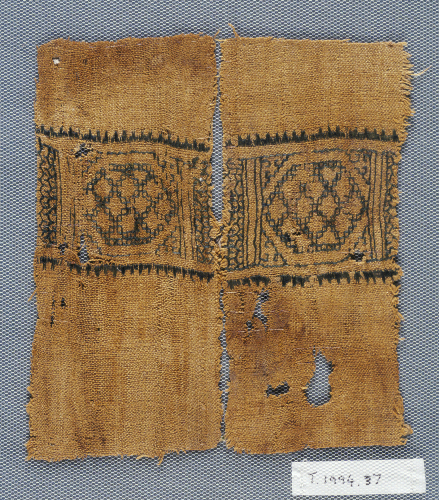 The textile can be found in the Ashmolean Museum. 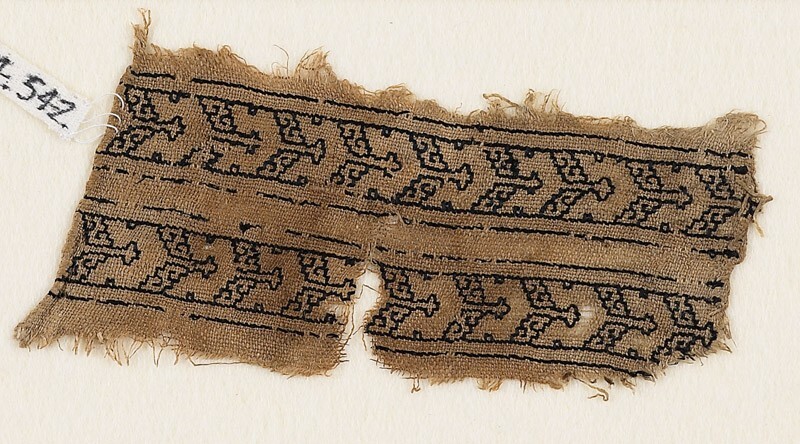 The details on this textile can be found at An interlocking zigzag embroidery. 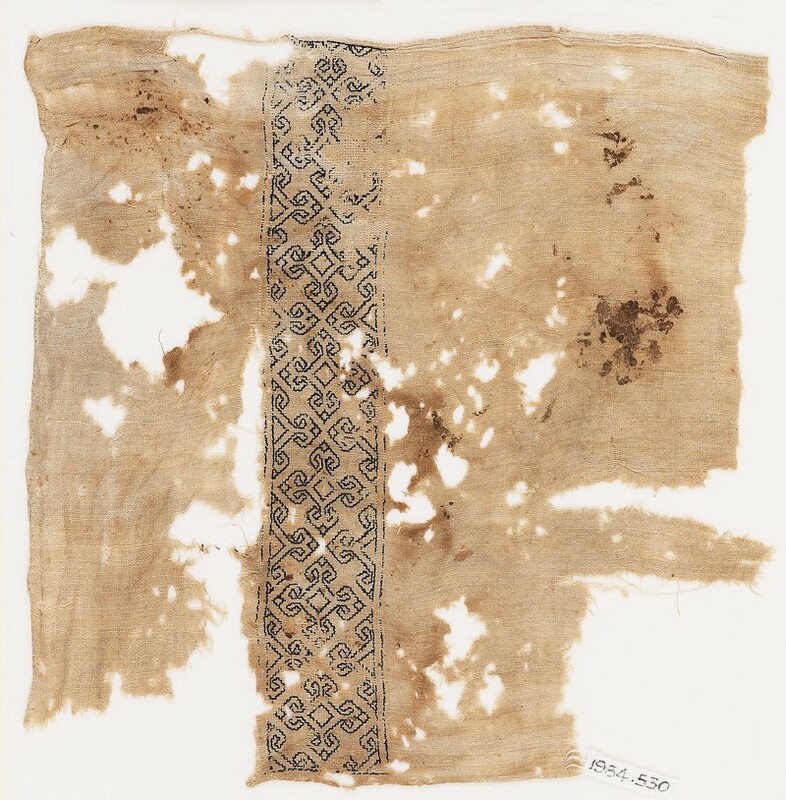 This textile can be found at the Ashmolean Museum. 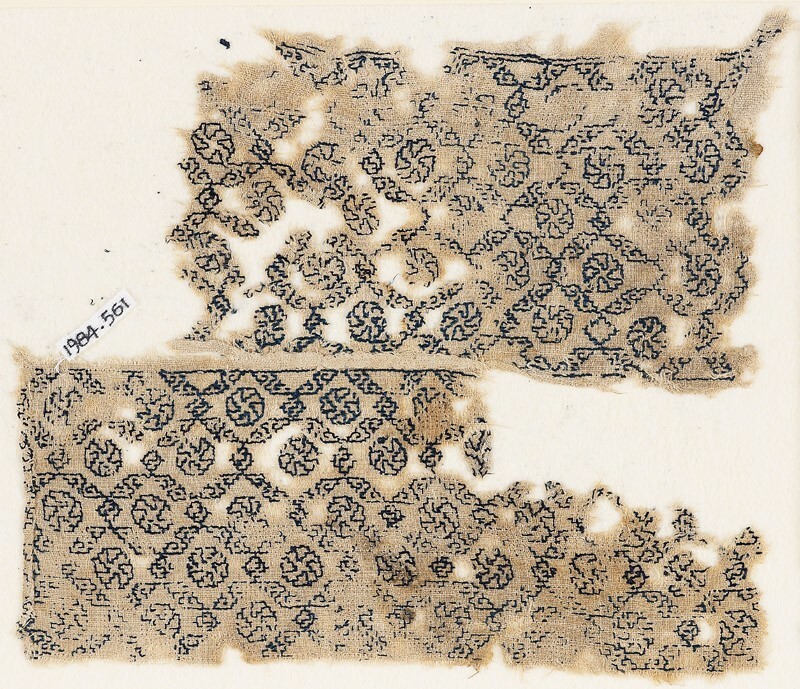 The details can be found in A blackwork with quatrefoils. This textile is in the Ashmolean Museum. Details on it can be found here- Two similar embroideries. 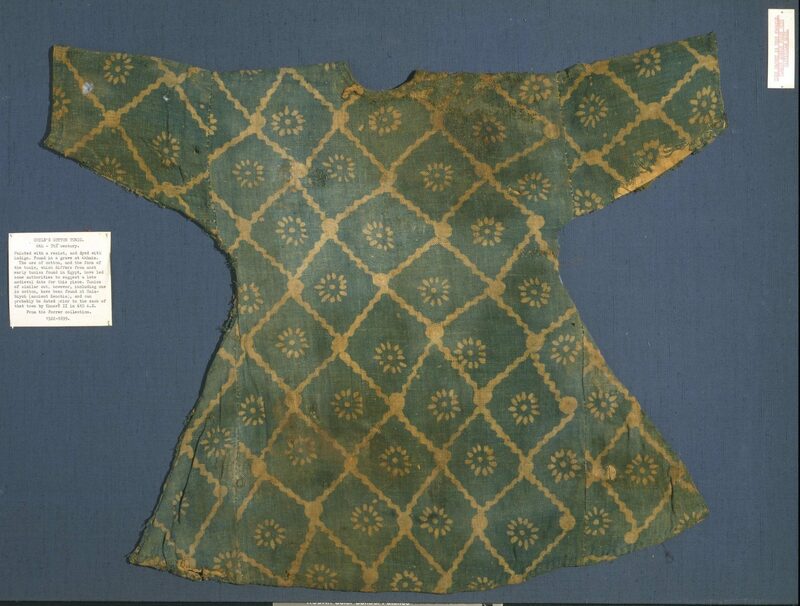 The top textile in the picture can be found in the Victoria & Albert Museum. 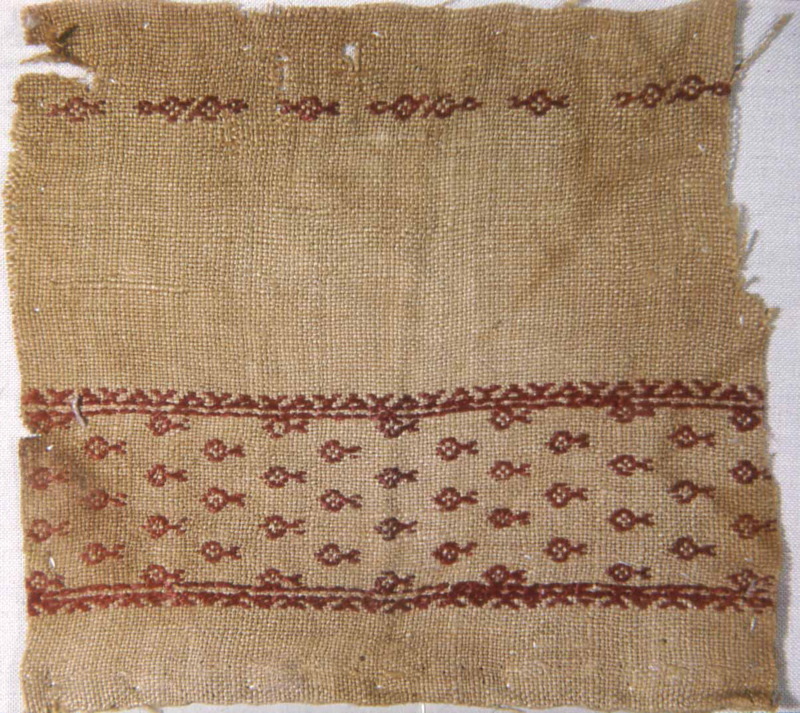 Details on the textile can be found at the post Two similar embroideries. 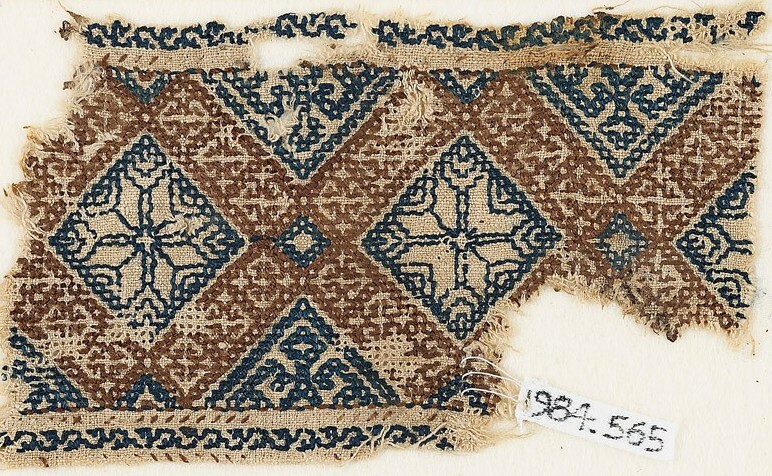 This textile can be found in the Victoria & Albert Museum. 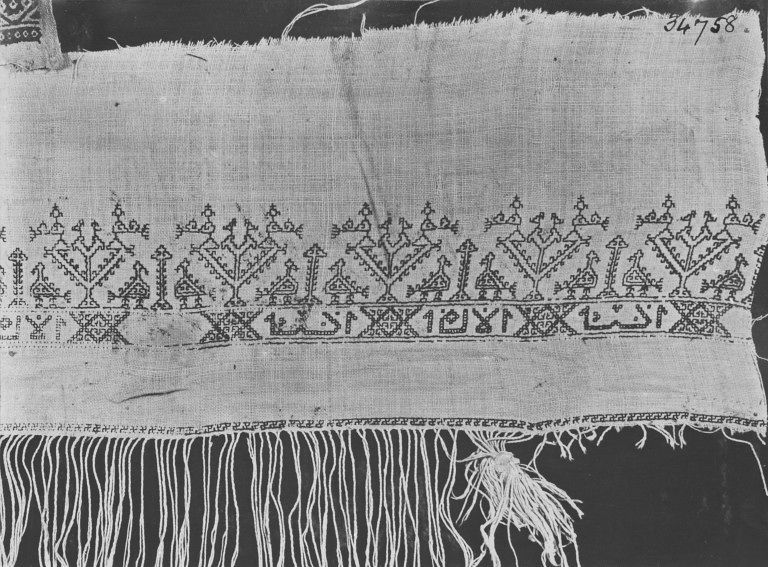 Details can be found in the post An embroidered Mamluk shawl. 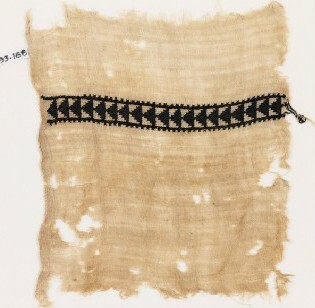 This textile can be located in the Ashmolean Museum. Details can be found in the post A diagonal embroidery with hooks and vines. 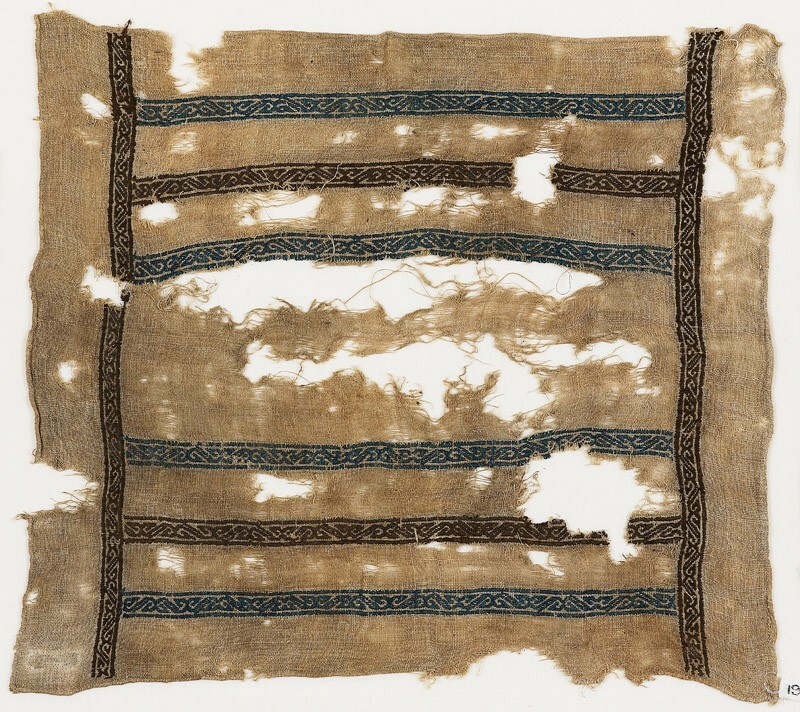 This textile is currently in the Ashmolean Museum. Details can be found in the post Possible turban or sash. This textile is in the Ashmolean Museum. Details can be seen in the post A grid of lozenges embroidery. This textile is in the Ashmolean Museum. Details can be seen in the post An octagon medallion embroidery. This textile is in the Ashmolean Museum. 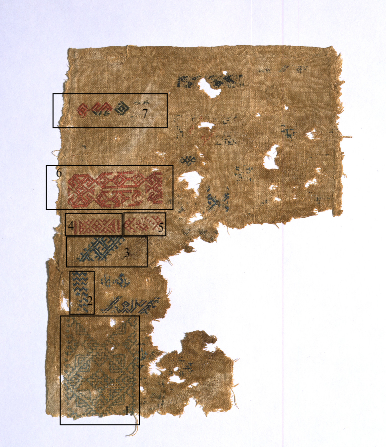 More details can be found in the post A textile with a diagonal grid embroidery. This textile is in the Ashmolean Museum. 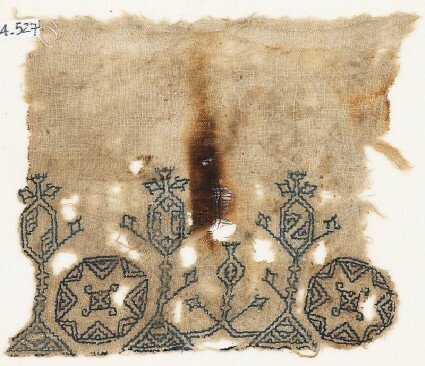 More details can be found in the post The first possible tunic embroidery. 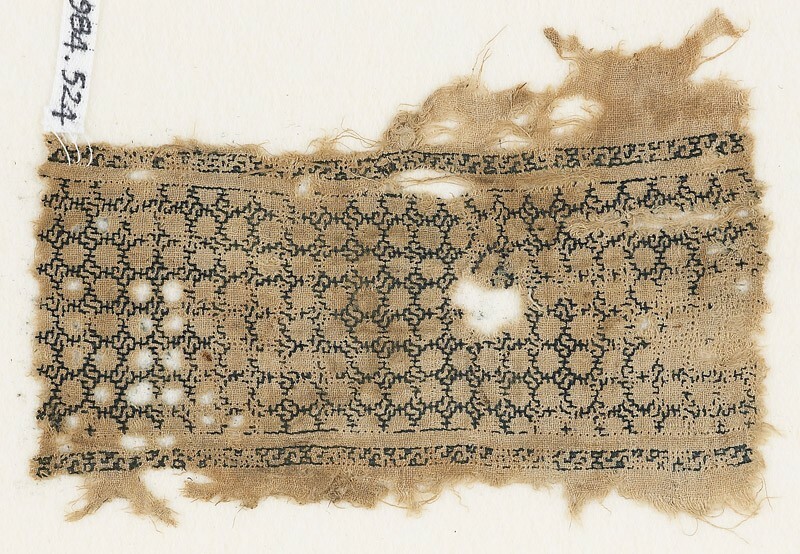 This textile is in the Textile Museum of Canada. 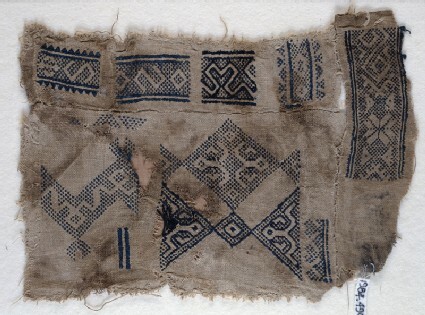 More details on the textile can be found at the post The Second possible tunic embroidery. 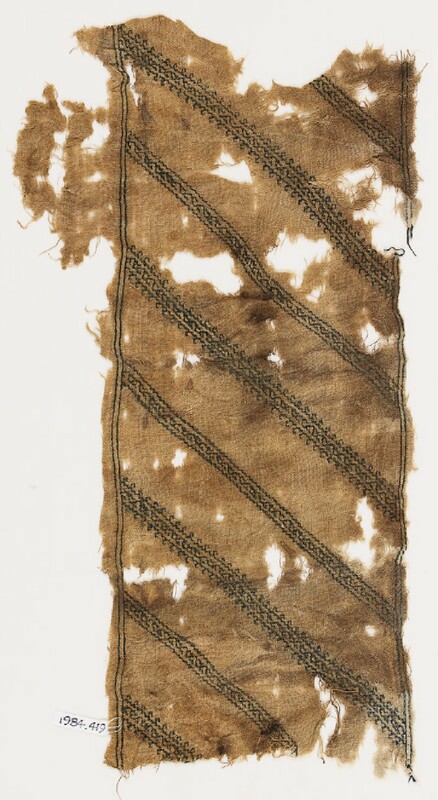 This textile is currently in the Ashmolean Museum. More details can be found at the post A third possible tunic embroidery. 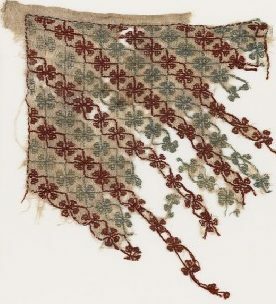 This textile is in the Ashmolean Museum. Details can be found in the post A fourth possible shirt embroidery. 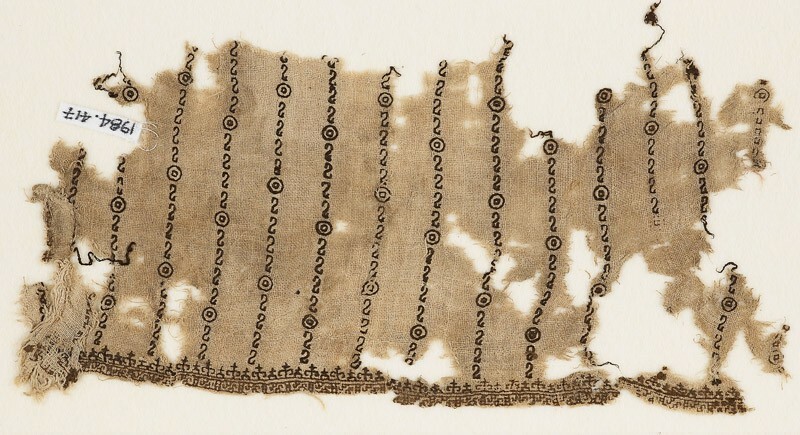 This textile is currently in the Ashmolean Museum. Details can be found at the post A fifth embroidered tunic. 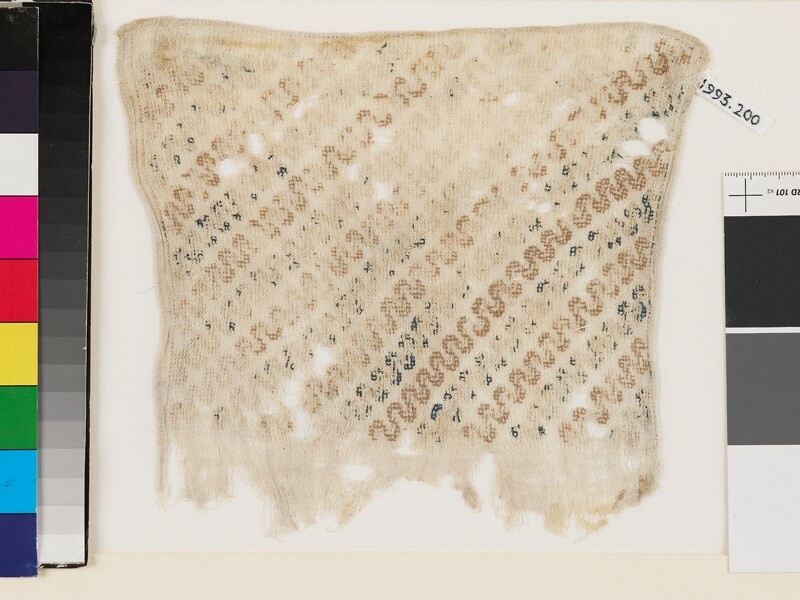 This particular textile can be found in the Ashmolean Museum. More details can be found at the post A possible sleeve embroidery. 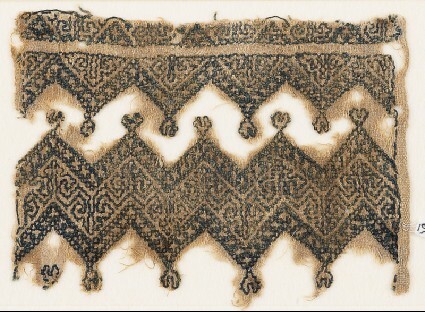 This textile can be found in the Ashmolean Museum. More details can be found on the post “A new pattern darning and cross stitch sampler”. 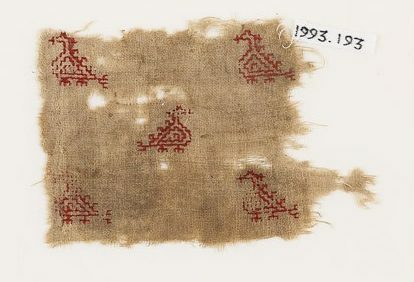 This embroidered textile is in the Ashmolean Museum. More details can be found on post “A new long arm cross stitch”. 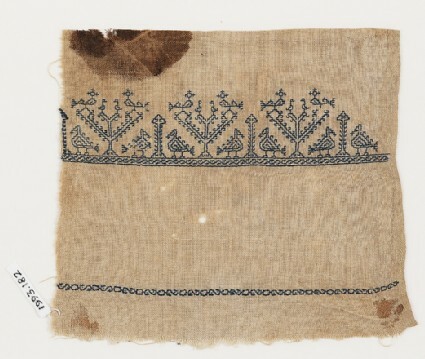 This embroidered textile is in the Ashmolean Museum. For more information please see post “A pattern darned textile”. This textile is in the Ashmolean Museum. For more information please read post “A new pattern darning chart”. 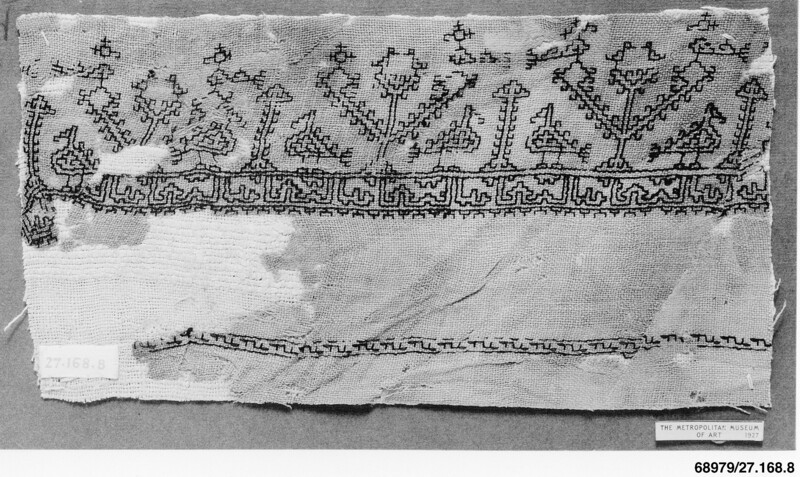 This embroidered textile is in the Ashmolean Museum. Please read the post “A new complex double running embroidery” for more information. 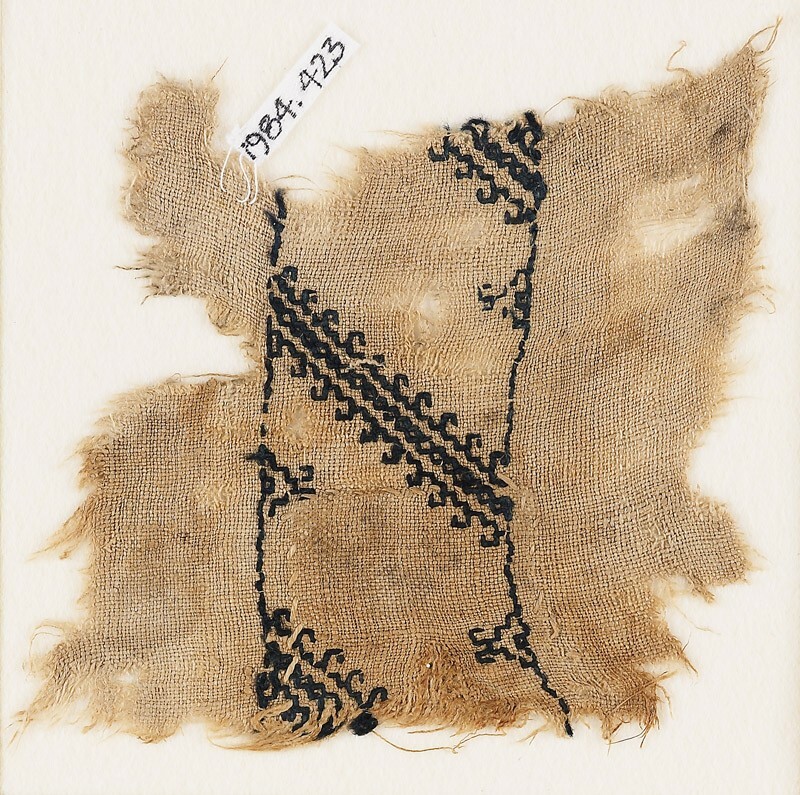 This embroidered textile is in the Ashmolean Museum. More information can be read in the post An embroidery once more. This textile is in the Ashmolean Museum. Please read A new embroidery chart with chevrons and diamond shapes for more information. 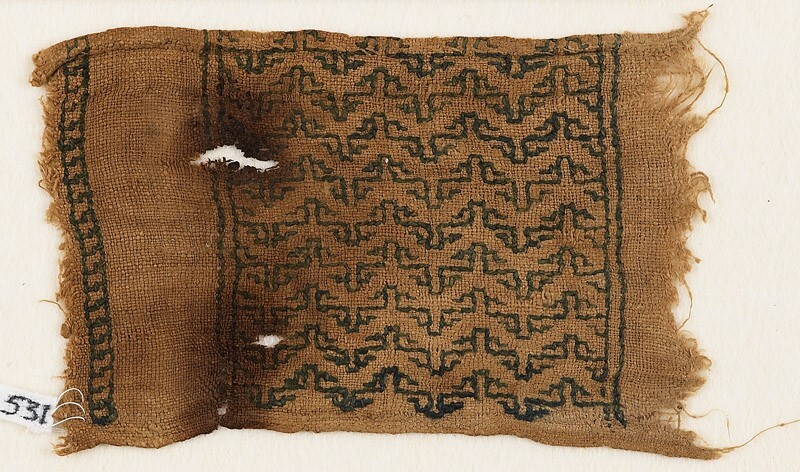 This textile is in the Ashmolean Museum. Please read post “Sn embroidery of interlacing chevrons and Maltese crosses” for more information. This textile is in the Ashmolean Museum. Please read post “A double running cotton embroidery” for more information. This textile is in the Ashmolean Museum. 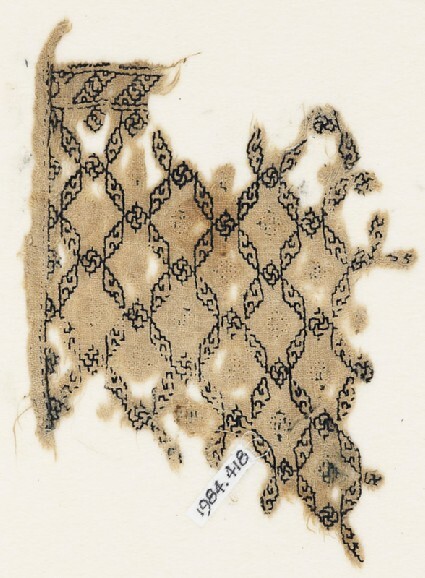 Please read post “A textile embroidered with quatrefoils and stems“. This textile is in the Ashmolean Museum. Please read post “Textile embroidered with pink and blue quatrefoils” for more information. This textile is in the Ashmolean Museum. More more information please read post “Textile embroidered with pink and blue quatrefoils“. This textile is in the Ashmolean Museum. Please read post “A textile with crosses in diamonds” for more information. This textile is in the Ashmolean Museum. 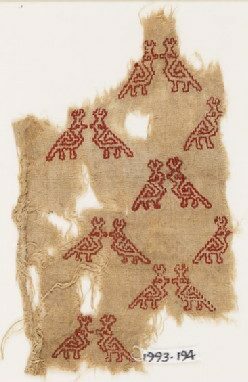 This textile is in the Ashmolean Museum. 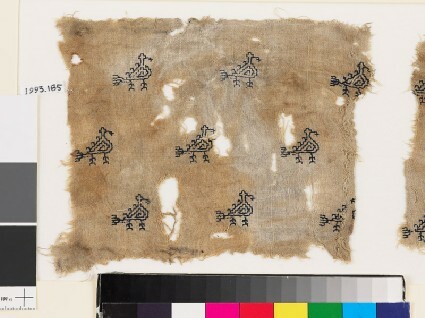 Please read post “Many birds!” for more information on the four textiles. 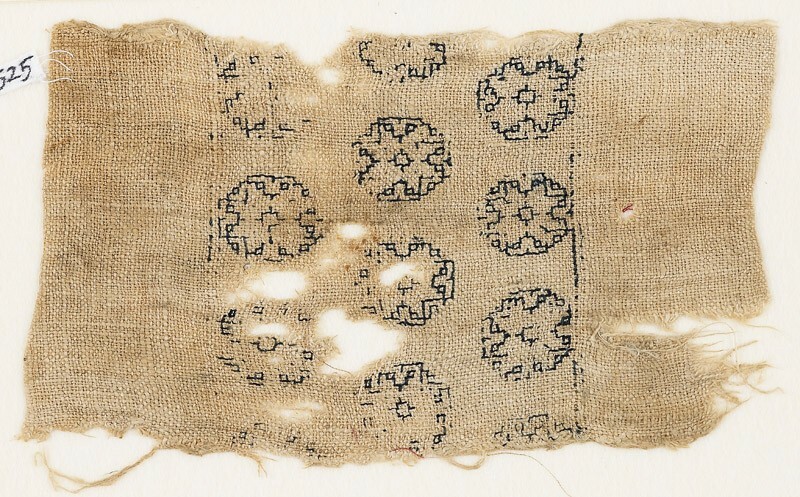 This textile is 12 cm by 17.5cm and thought to have been made between the 10th-15th century. It is tabby woven linen embroidered in double running blue flax thread. For more information please read the post “Back for this year!”. 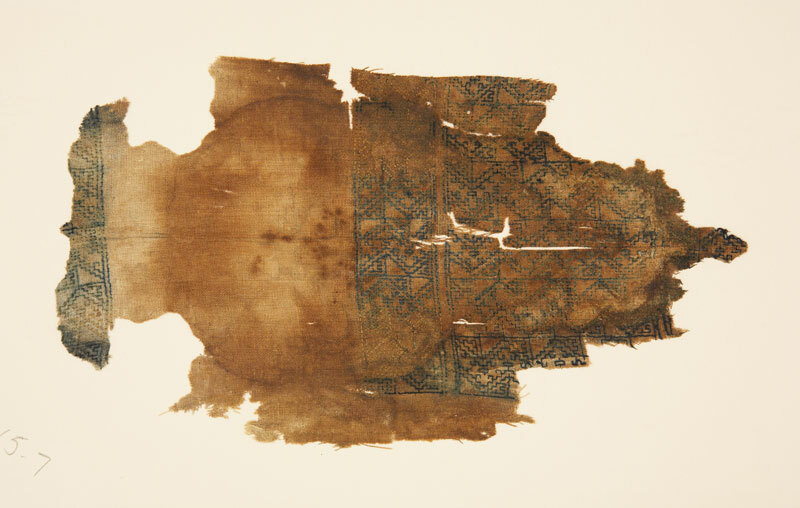 The textile is currently in the Ashmolean Museum. 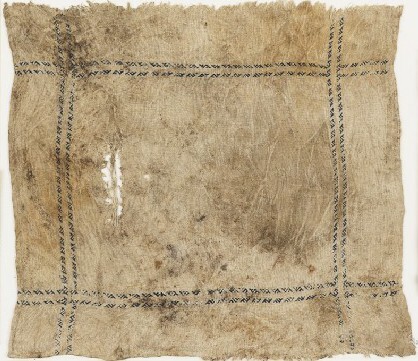 This textile is 21 cm by 18.5 cm. 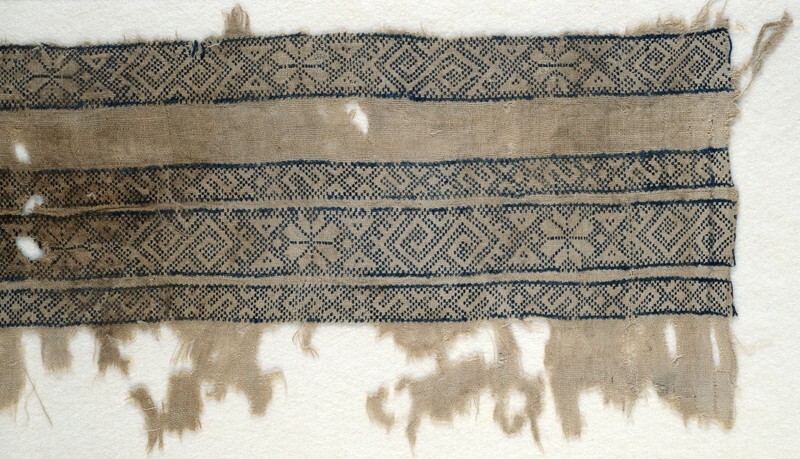 The plain woven tabby linen has been embroidered in double running blue and brown silk. Made in Egypt between the 10th-15th century. For more information please read the post “A wave embroidery”. The textile is in the Ashmolean Museum. absolutely lovely! thank you for this. Sure! I would love to see it. Looking at it it doesn’t look Egyptian to me but more Greek Ottoman. Have you taken it to a textile specialist at all? I don’t cover more modern embroidery. I’m afraid that I am not sure where else to take it from here. I know they have similar looking embroideries in the V&A Museum. Perhaps email them & see what they recommend? 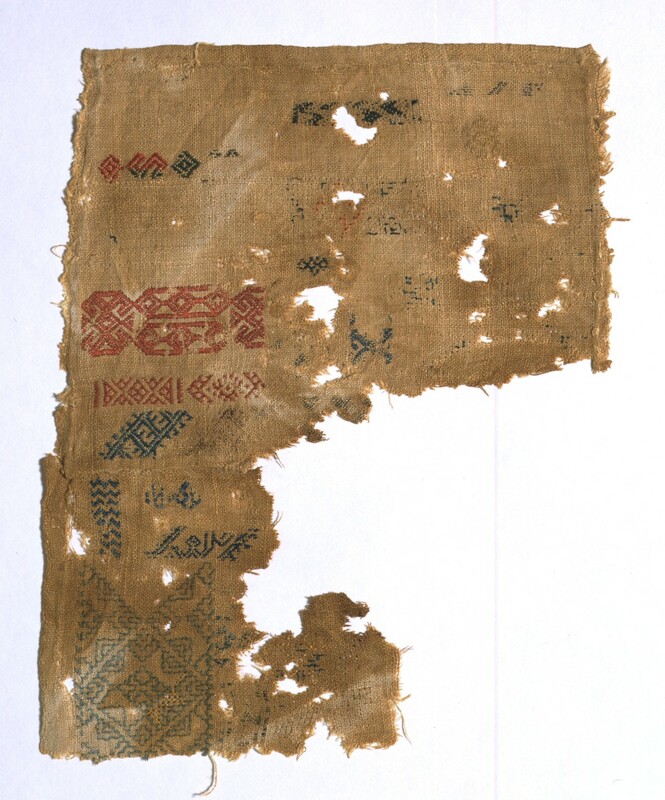 I’m currently working on a publication on Coptic textiles. You have an image of four tunics in black and white that I would like to include in my piece. 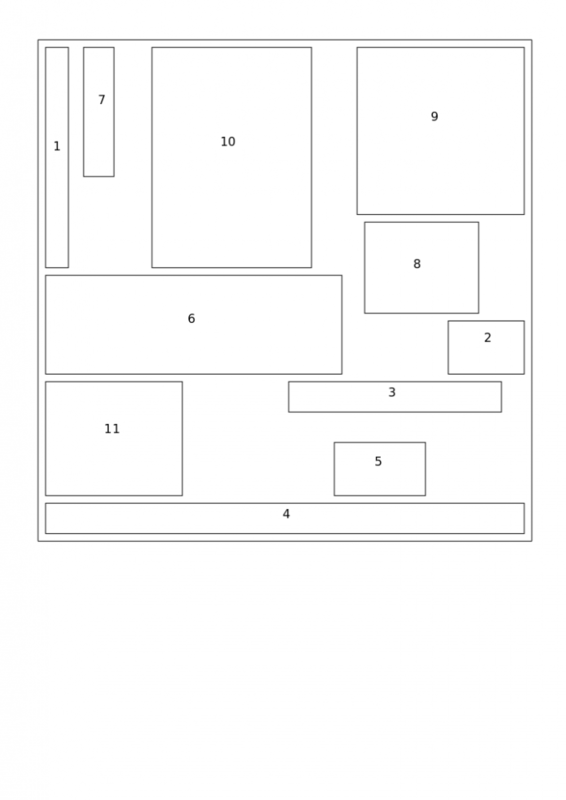 Can you tell me where you obtained the image? Thank you. I had found it on Marla Mallett’s website. In the original post the link is at the bottom.